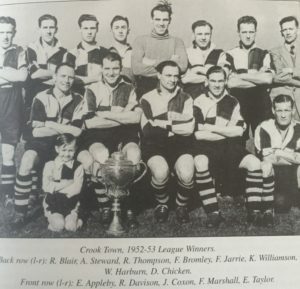 Once hostilities were over and football was able to return, The old club Crook Town was replaced by Crook CW and was accepted back into the Northern League. 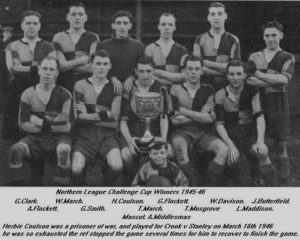 On the 1st May 1946 3,500 watched Crook CW contest the League Cup Final against Bishop Auckland at Dean Street, Shildon. Crook CW ran out 2-1 winners to lift the trophy. With football firmly back on the agenda after the War Crook CW were now regularly plying in front of crowds around 3,000. However, games against the Bishops could see crowds in excess of 6,000. 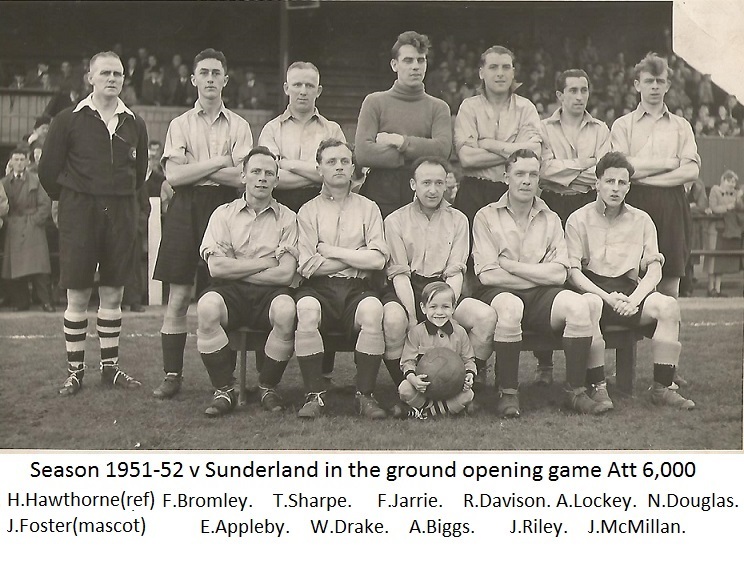 The 1948/49 season saw the introduction of numbered shirts for the first time. 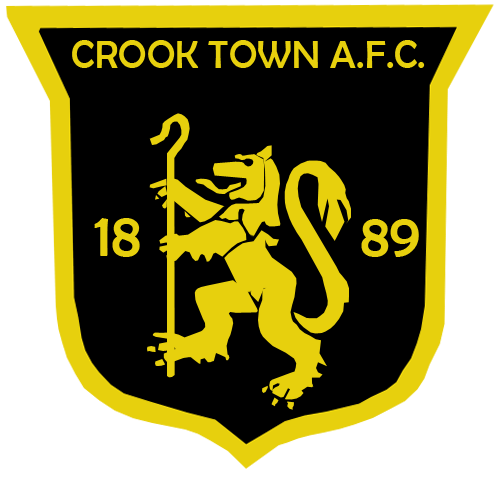 Crook CW had success in the Amateur Cup reaching the semi final stage. 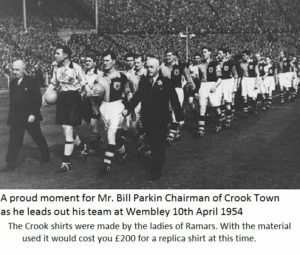 On Saturday 9th March Crook were due to play Romford at Roker Park but there was a problem. Albert Nairn one of Crooks star players was due to get married that afternoon so would miss the game. However, Common sense prevailed and the wedding was moved to the morning so Albert could make the game in the afternoon. The crowd at the game was 24,215 with an estimated 20,000 of those being from Crook but the game ended in a 2-2 draw and a replay was required which took place at West Ham in front of 24,995 but Crook lost out 3-0. 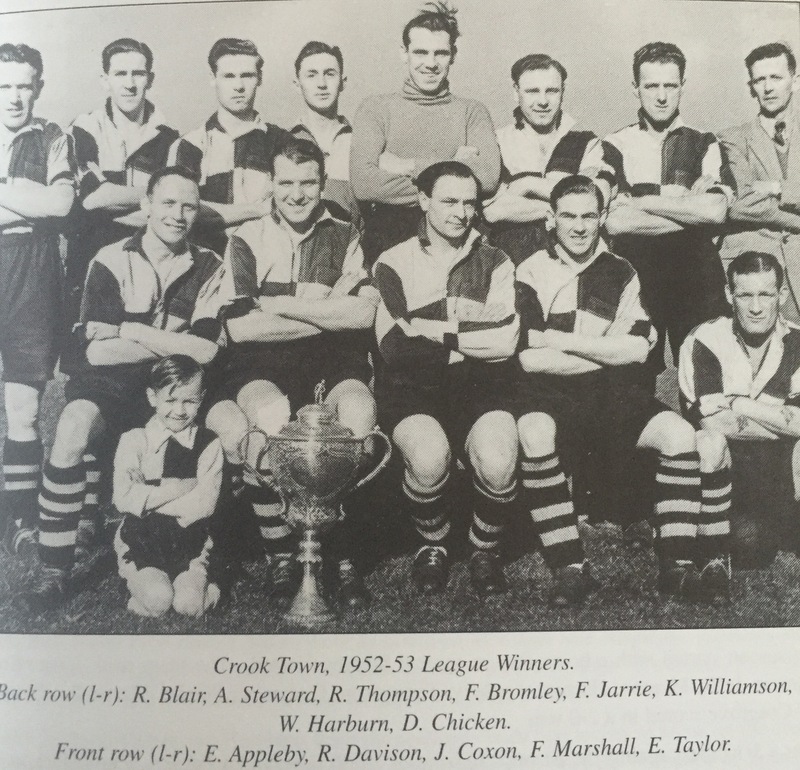 The 1949/50 season saw the club once again revert back to the old name of Crook Town. They were now fielding a settled team which was leading to more consistent performances on the pitch. On the 7th Jan 1950 the crowd was treated to a goal fest against Spennymoor ay Millfield. Crook found themselves 2-0 down in the first 10 minutes but rallied to record a 6-2 victory by the end of the game. 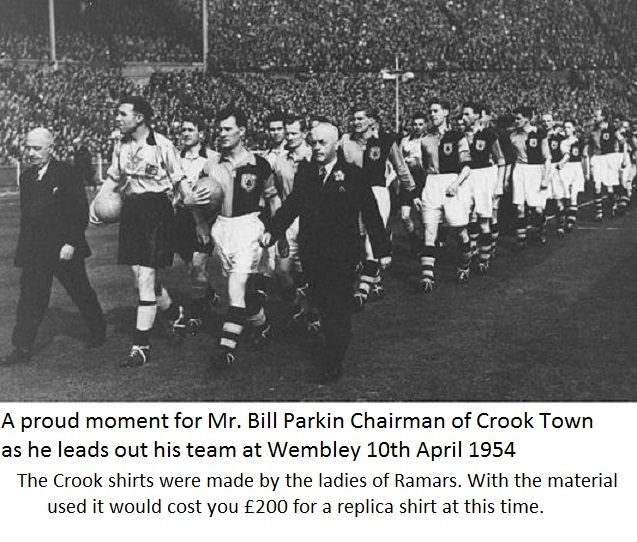 On 28th January 1950 Crook took 1,000 fans to an away Amateur Cup tie at Wycombe Wanderers. Crook lost the game 1-0 but an injury to Centre Forward Lockey seeing him limping around on the wing for the rest of the game giving Crook very little cutting edge up front. 1951/52 Saw more development to Millfield with £3,000 being spent on drainage and levelling the playing surface. Indeed 15,000 tonnes of earth were removed. New touchline perimeter fencing was also installed which is still in place to this day. 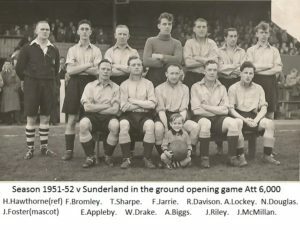 For the ground opening there opponents were 1st Division Sunderland. A crowd of 6,000 watched an entertaining game with Crook losing out 4-3 in the end. It was around this time that the Amateur Cup matched were drawing crowds of well over 10,000. In 1952 Millfield was to host the first non cup final televised game. 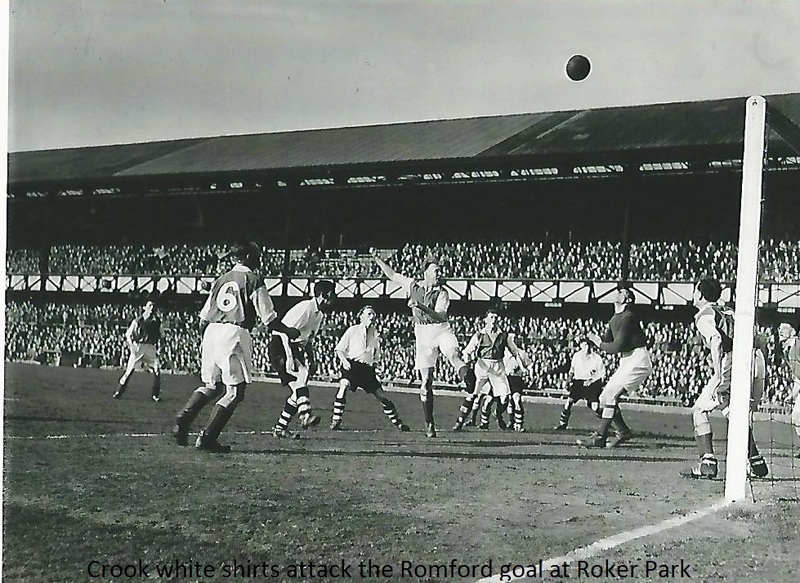 An Amateur Cup game against Romford played in front of a crowd of 13,500. Crook were outstanding on the day and eventually ran out 3-1 winners. on 23rd February that year the 4th round of the Amateur Cup was played at Millfield with the opponents being Walton and Hersham. In front of a record crowd 17,500 Crook could only record a 0-0 draw and eventually lost out in the replay. 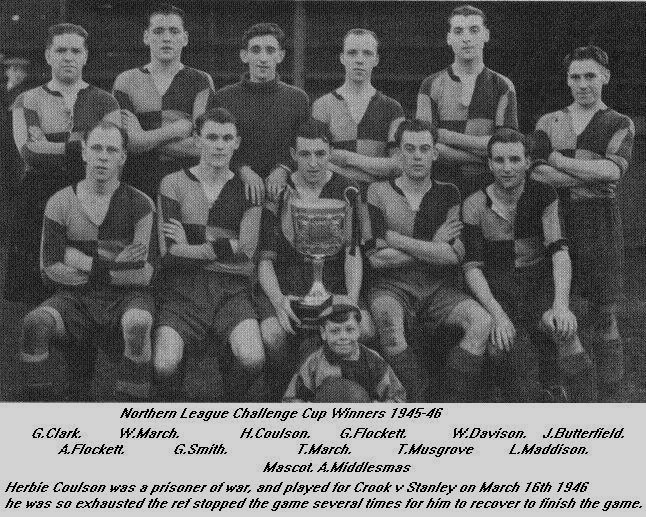 The 1952/53 season saw Crook once again crowned League Champions. One particular victory of note that season was a 7-1 mauling of local rivals Bishop Auckland, their heaviest defeat for some time. 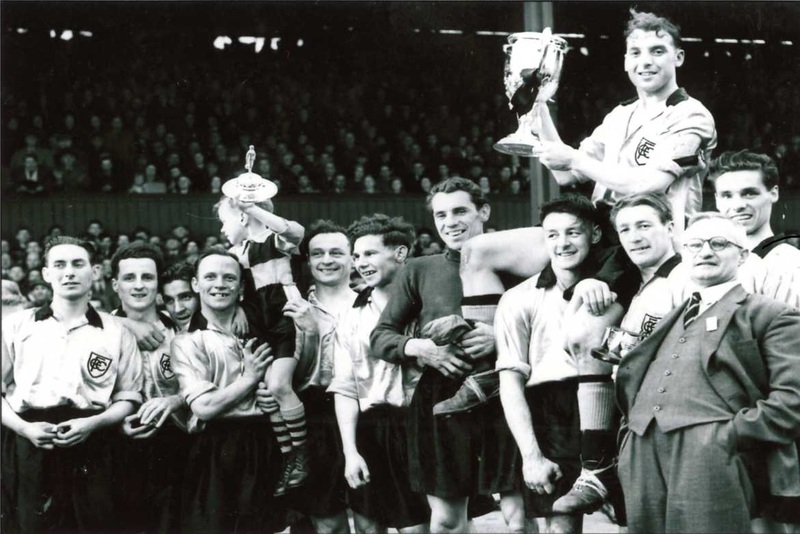 The 1953/54 season was one of the most memorable in the clubs history. The team now had a familiar ring to it with names like Jarrie, Jeffs, Appleby and Thompson appearing regularly. After a poor start to the season, indeed the programme stated on the 3rd October “The team is feeble and of little consequence”, the writer was made to eat his words as Crook reached the semi final of the Amateur Cup. They were drawn away to Walthamstow with game being staged at White Hart Lane home of Tottenham Hotspur. In front of 25,100 fans the game was drawn but an interesting incident was that at half time Jimmy McMillan the Crook left winger was suffering from food poisoning and there were doubts that he could continue. However, in the days of no substitutes in stepped skipper Bobby Davison saying “Come on lad! You might only get one chance to go to Wembley”. Little did he know! In a thrilling replay at Roker Park Crook came out 3-0 winner to set up the final of all finals with the old enemy Bishop Auckland at Wembley Stadium! 100,000 fans turned out for the final to witness a spectacle which was described by the famous commentator, Kenneth Wolstenholme, as “The best 2 hours of sport in 1954”. The replay which was held at St James’s Park, Newcastle was watched by a crowd of 60,000. Crook raced in to a 2-0 lead and looked set to lift the trophy but a spirited come back in the 2nd half by Bishops saw the game end in yet another draw with the scores at 2-2. 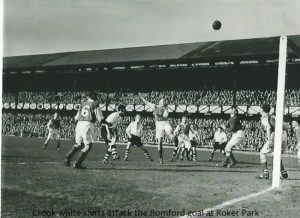 In the second replay held at Ayresome Park, Middlesbrough a crowd of 40,000 were present making it the highest aggregate gate in English football history 200,000. This time Crook were not to be denied and in a close fought game they came out 1-0 winners after a hotly disputed goal by Bishop which was disallowed by referee Alf Bond for a push on Bobby Davison which Bishop fans deny happened to this day. Another incident was to occur after the final. The joyous journey home by the Crook Town players was abruptly interrupted on the Newton Cap Bridge just outside Bishop Auckland as a number of the residence of the town gathered to throw “Unpleasant Things” at the Crook team bus. 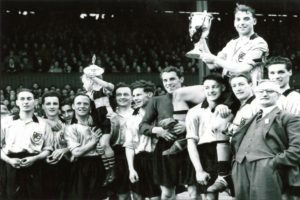 The 1954/55 season also proved to be a momentous one. 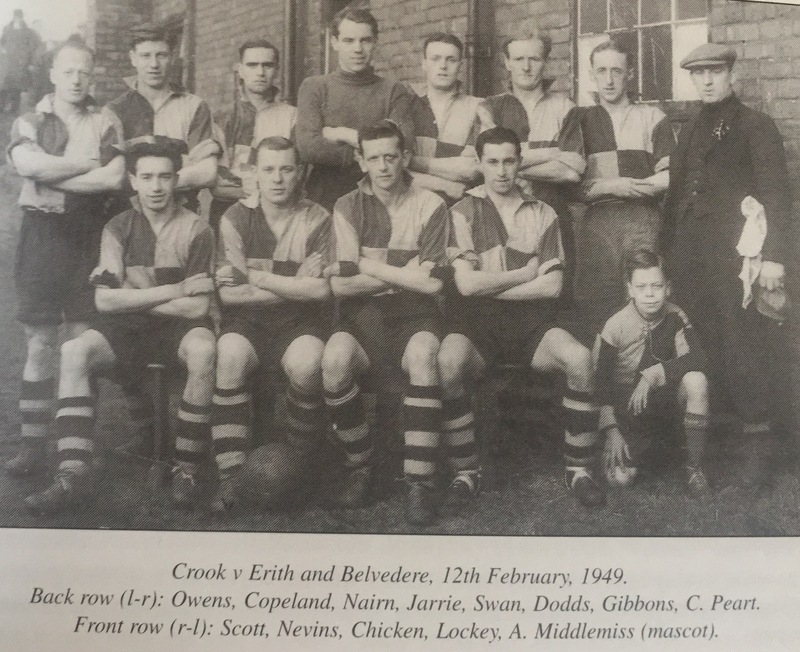 Crook reached the 1st round of the FA Cup narrowly losing to Brentford under hard wintery conditions but by the 5th March 1955 Crook were in the running for the league championship, were in the finals of the Durham Challenge Cup, the League Cup and the Durham Benevolent Bowl. Not surprisingly the league campaign petered out due to the number of games to be played but they won the Durham Challenge Cup 3-0 against Bishop Auckland at Feethams and also won the Durham Benevolent Bowl 5-3 against Evenwood. However, Bishop were to gain a little revenge as they defeated a Tired and Weary Crook 6-0 in the League Cup Final.